USDA has the science-based solutions and technical experts on the ground today to help farmers and ranchers through drought and to prepare our country for weather events in the future. USDA offers technical and financial assistance to farmers and ranchers to cope with drought across the nation. Every day, USDA is closely monitoring the drought and assisting farmers and ranchers with implementing voluntary conservation practices that help alleviate the drought's effects. 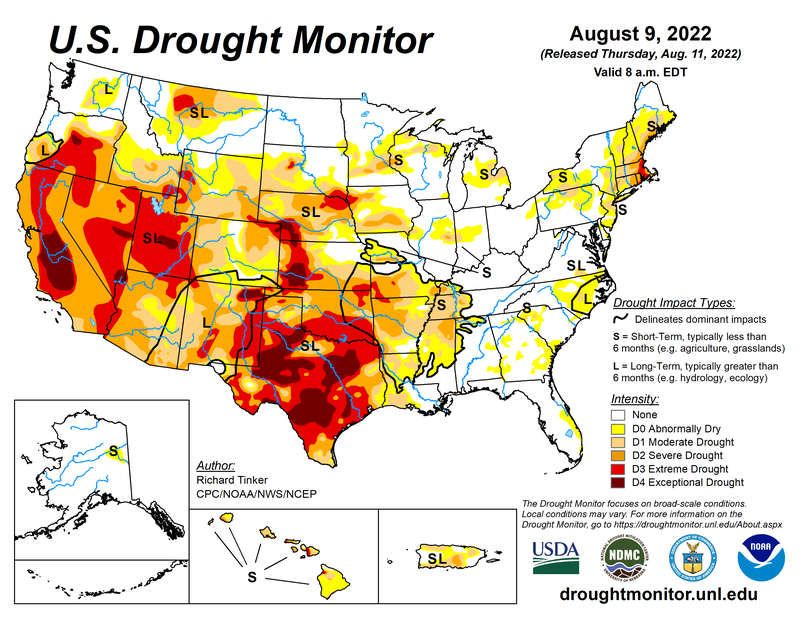 The U.S. Drought Monitor is a weekly map of drought conditions that is produced jointly by the National Oceanic and Atmospheric Administration, the U.S. Department of Agriculture, and the National Drought Mitigation Center (NDMC) at the University of Nebraska-Lincoln. Please provide a description of how drought is affecting you, your livelihood, your activities, etc. The Drought Impact Reporter (DIR) is the nation's first comprehensive database of drought impacts. The DIR collects and displays reports, providing researchers and interested members of the public with context and detail of on the ground drought impacts across the nation. The CoCoRaHS network is a unique grassroots network of thousands of trained volunteers of all ages and backgrounds working together to improve meteorological science by measuring and reporting precipitation amounts (rain, hail, and snow). CoCoRaHS is the largest provider of daily precipitation observations in the United States. The data from these observations are used by USDA and the National Oceanic and Atmospheric Administration (NOAA) for tools such as the United States Drought Monitor.